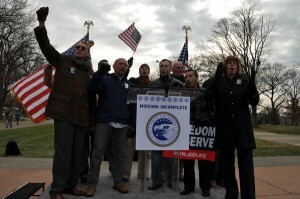 Braving the December cold, around 100 participants gathered near the U.S. Capitol at the Upper Senate Park for the event, which was organized by the Servicemembers Legal Defense Network. Those in attendance shouted the refrain “Don’t Go Home!” as they demanded that lawmakers continue work on Capitol Hill until “Don’t Ask, Don’t Tell” is repealed. The rally comes in the wake of a devastating defeat that supporters of “Don’t Ask, Don’t Tell” repeal suffered on Thursday when the Senate failed to move ahead with major defense legislation containing repeal language by a vote of 57-40, three votes short of the 60-vote threshold necessary to end a filibuster. A number of veterans and current service members — gay and straight — addressed the rally and called for an end to the military’s gay ban. Mike Almy, a gay former Air Force communications officer who was discharged in 2008 under “Don’t Ask, Don’t Tell,” also called on the Senate to stay in session until work is done on lifting the military’s gay ban. Ret. Maj. Gen. Dennis Laich, who’s straight served in the Army for 35 years, said repeal of “Don’t Ask, Don’t Tell” is needed because the ban compromises the integrity of the U.S. military. Should the Senate not repeal “Don’t Ask, Don’t Tell,” Laich predicted what he called a “Spartacus moment” in which the estimated 66,000 gay and lesbian people serving in the military would declare their sexual orientations under the current law. Speakers at the rally had particularly strong words for senators who were among the “no” votes on Thursday preventing the “Don’t Ask, Don’t Tell” legislation from coming to the Senate floor. Two speakers who hailed from West Virginia also had harsh words for Sen. Joe Manchin (D-W.Va.), the only Democrat who voted against the motion to proceed Thursday on “Don’t Ask, Don’t Tell” repeal legislation. Sgt. Jared Towner, a straight member of the West Virginia Army National Guard, said the “very, very established progressive youth element” in his state is disappointed in Manchin for his vote and could decline to back him when he’s next up for election in two years. Former Army Sgt. Pepe Johnson, a field artilleryman and Clarksburg, W.Va., native who was discharged under “Don’t Ask, Don’t Tell” in 2003, said he was “embarassed” because Manchin “decided to be a lone ranger” and vote against repeal. Many participants echoed the general tenor of the rally that Congress should stay in session for the time that’s needed to repeal “Don’t Ask, Don’t Tell” before going home. Toby Quaranta, 25 and a gay D.C. resident, said he participated in the rally because he wants “people everywhere to know” that supporters of “Don’t Ask, Don’t Tell” repeal don’t want lawmakers to adjourn until the law is off the books. “I think the Senate has a responsibility to the service members and to the people who just re-elected a lot of them to make sure that they get their business done before they leave town,” Quaranta said. Bridget Geraghty, 25 and a lesbian D.C. resident, expressed frustration that the Senate was unable to act on “Don’t Ask, Don’t Tell” repeal when the vote came before the chamber on Thursday. Provost, a gay Navy seaman stationed at Camp Pendleton, Calif., was found dead on base last year and was possibly murdered because of his sexual orientation. He reportedly had complained to family members that was being harassed before he was killed. Also among the rally participants was Rea Carey, executive director of the National Gay & Lesbian Task Force. Following the rally, she told the Blade she was “extremely disappointed” in the Senate vote on Thursday, but expected repeal advocates to continue toward their goal. “I’m pleased that there are senators who are going to continue to push in this lame duck, and all of us at this rally and elsewhere around the country are going to push with them,” she said. Many repeal advocates are pinning their hopes on new stand-alone legislation that Lieberman introduced in the Senate following the defeat on Thursday of the fiscal year 2011 defense authorization bill. The new stand-alone measure is identical to the repeal provision in the defense legislation. Following the rally, Sarvis expressed optimism about the chances of passing the stand-alone repeal legislation in the lame duck and said repeal advocates are working to come up with 60 votes to move forward with the legislation in the Senate. Sarvis said attaching repeal language to the continuing resolution that Congress will soon vote on to extend funding for the U.S. government is another option on the table. Still, Sarvis said using this measure as a vehicle for repeal would be “one of the last opportunities” for legislatively ending the military’s gay ban this year. Could SLDN have staged this rally” [they didn’t have the guts to even call it a “protest”] any farther from the windows of the Capitol? Members of Congress would need binoculars to see what it was about. Some very good people marched into a mock battle too late by the Barney Fife of Generals. And, with respect, the details of Provost’s death put the weight of evidence on his being shot simply because he was in the wrong place at the wrong time just as would have someone heterosexual—the guard shack his extremely unstable murderer had to pass to enter the base with the gasoline he planned to use to try to set fire to a hovercraft in retaliation for being punished for drug use and a DWI. That does not mean the stories were untrue that Provost might have been harassed on base for being gay, but leaping to the conclusion that every murder of someone gay is related to his or her sexuality serves no one. Thank you. “Braving the December cold?” Going outside in the cold is bravery? “100 participants.” Wow, that’ll show em. Lay this at the foot of he who is responsible — NObama. Pray for a one term. Michael Bloomberg in 2012. Ask them to vote FOR DADT Repeal. Even our Conservative Senators need to know that we will remember them in the next elections. Stop what you are doing and Make the call now!